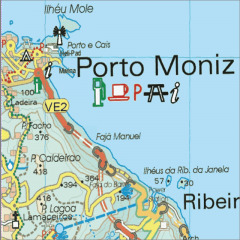 We are always looking for new map sources to enhance our premium maps portfolio and we are aware that the rugged scenery and warm climate make the islands of Spain and Portugal very popular walking destinations. So, we have teamed up with book and map publisher “Discovery Walking Guides” to offer a series of their detailed “Tour & Trail” map products for the Canary Islands, the Balearic Islands, Madeira and some specific walking areas on Mainland Spain in Andalucía and Alicante. La Gomera (1:35K) topographic map covering the whole of the island of La Gomera. Lanzarote (1:40K) topographic map covering the whole the island of Lanzarote, this map is marked with all the walking routes from Walk! Lanzarote. La Palma (1:40K) topographic map covering the whole the island of La Palma. This map is marked with the GR (Gran Recorrido) and PR (Pequeno Recorridos) Hiking Routes. Tenerife (Hikers Map) (1:25K & 1:35K) topographic map covering the hiking areas of Tenerife. Regional coverage includes: Anaga, Las Canadas, Vilaflor, Tenerife West, Tenerife North & Tenerife South, marked with the walking routes of Walk! Tenerife. (NB Does not cover all of Tenerife). Mallorca (North & Mountains) (1:40K) topographic map covering the North and Mountains of Mallorca. Marked trails include: walking routes of Walk! Mallorca (North West). Menorca (1:40K) topographic map covering the island of Menorca. This map includes the Walk! Menorca routes and the Cami de Cavalls, bike trails. Costa Blanca Mountains (1:40K) topographic map covering the walking areas in the Costa Blanca Mountains, Alicante province. Sierra de Aracena (1:40K) topographic map covering this walking area in western part of Andalucía, close to the Portuguese border. Axarquia (1:40K) topographic map covering this popular walking area to the east of Malaga in Andalucía. Each map can be purchased and installed on your mobile either using in-app purchasing or via the ViewRanger webshop. The maps are stored for offline use, so they work without mobile signal and there’s no risk of incurring roaming charges whilst on your trip. The GPS will work with or without a mobile signal. Maps costs from £4.99.